A study recently published in JAMA Internal Medicine stated that Charlie Sheen’s HIV-positive disclosure “corresponded with the greatest number of HIV-related Google searches ever recorded in the United States.” For better or worse, celebrity health news has the potential to create more awareness for a given condition than the most carefully planned outreach campaigns by respected health organizations. The term “15 minutes of fame”, it seems, may be applied to more than just a passing fad or Internet meme – it can also apply to the public consciousness during an opportunity for education and information dissemination. Even if the means are not necessarily ideal, Americans sought information on HIV because HIV found its way into a different arena of the public discourse. The same could be said about conversations about suicide after Robin Williams’ tragic passing. But what can we do during those “15 minutes” to make sure the best, most memorable, and effective information is made available and accessible to newcomers to certain health discussions – like suicide and suicide prevention? What has been done in the past to reach people looking for answers? Specifically, was the Suicide Prevention Social Media (#SPSM) hashtag used effectively during hours and days after we learned about Robin Williams’ death to share information and resources to newcomers to the online conversation? First, let’s look at the big picture. Robin Williams’ died on August 11, 2014. While Symplur does not track celebrity mentions exclusively, we can see how many tweets included #suicide (1) and how many times his named occurred along with #suicide in a tweet (2) in the form of “Robin Williams”, “#RobinWilliams”, “#RIPRobinWilliams” or similar variants. Prior to this news announcement, the #SPSM chat was on a summer break. The last tweet chat they conducted was on June 29, 2014 with 1,291 tweets recorded. 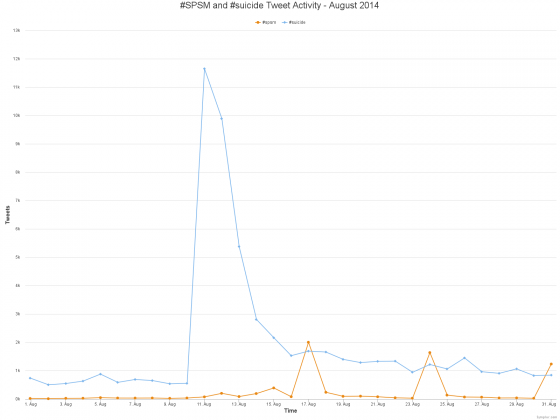 Between that date and August 11, #SPSM usage averaged 54 tweets per day (3). All of this should put the effort of the #SPSM moderators in a better context as we look at what happened after the news about Robin Williams broke. 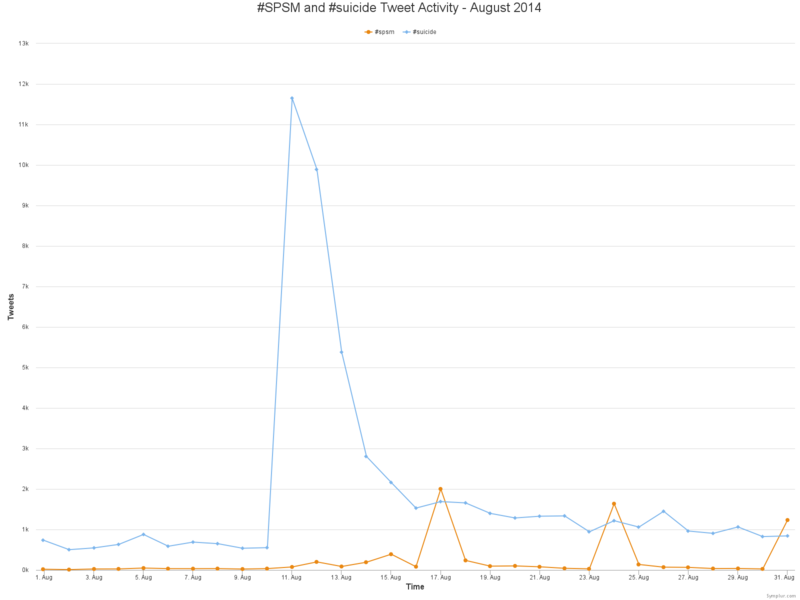 This graph (4) shows mentions of #suicide compared to #spsm over the month of August. The spike in #suicide mentions is the day of Williams’ death, 11,648 tweets (5). Followed by another 9,890 tweets the following day. SPSM returned from their summer break to talk about Robin Williams and how his death was being discussed in the media with their highest participation at the time, and second highest participation of all #SPSM usage with 2,002 tweets on Sunday, August 17 (6). During this time, hundreds of links are being shared along with tweets including #suicide. While most of those links are to news organizations and various reports and obituaries, resources for mental health support and addressing the sensitive nature of discussing suicide are also shared (7). “Talking about suicide and Robin Williams’s death” was widely shared and discussed with both #suicide and #SPSM hashtags (8). As the week went on, and the #SPSM chat schedule resumed, the most trafficked links revolved around the chat itself, including links to chat transcripts, video chats, and suicide prevention resources (9). These links provided multiple opportunities for newcomers to #SPSM to learn about the chat and how to participate in future conversations with that community, growing that community to create new, informed advocates in the realm of suicide prevention. 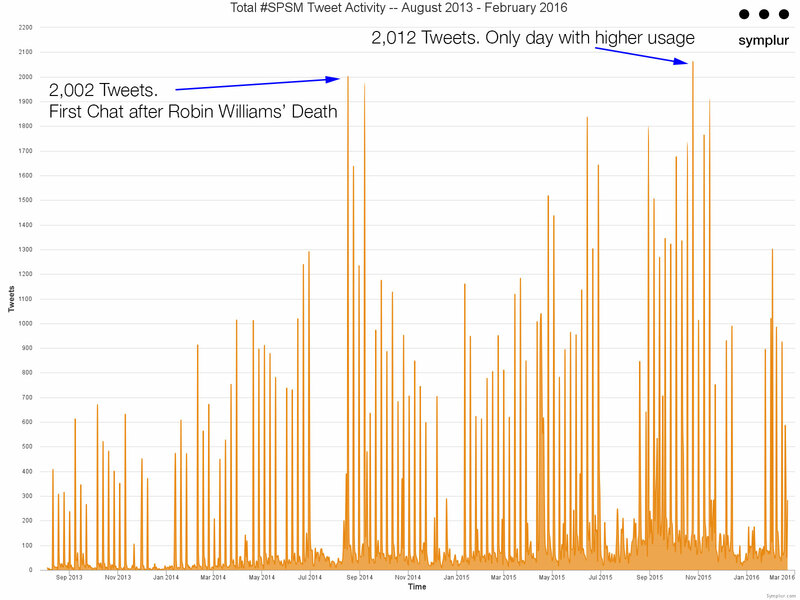 Since Robin Williams’ death, the #SPSM tweet chat has only had one day with more tweets since the chat they held on August 17, 2014, the Sunday after his passing (10). As a community, #SPSM has answered the call to provide a safe and engaging space to discuss a sensitive topic like suicide. Unfortunately, there’s no concrete metric for suicide prevention. However, the increased #SPSM traffic since August 2014 (10) suggests people paying attention to tweets including #suicide are also noticing, and more importantly engaging with the conversations including #SPSM. Sometimes, the best you can do is provide a safe space for people when they are looking for help. The #SPSM community embodies that effort. From my point of view, that’s the mark of a strong patient community. If you’d like a closer look at the data behind this post, you can find everything here. As the Patient Community Advocate at Symplur, Christopher is responsible for bringing data to the patients. He believes in the power of storytelling, that the stories we share strengthen patient communities, and that every story is worth telling no matter how ordinary it may appear to be on the surface.